To reduce the probability of fogging up inside of the windshield, the air intake or air conditioning are controlled automatically according to certain conditions such as or position. To cancel or return to the defogging logic, do the followings. 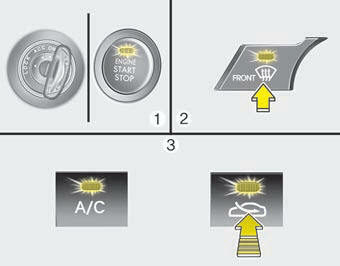 If more moisture is in the vehicle, higher steps operate as follow. For example if auto defogging does not defog inside the windshield at step 1 Outside air position, it tries to defog again at step 2 Blowing air toward the windshield. 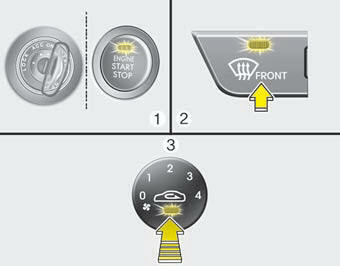 If your vehicle is equipped with the auto defogging system, it is automatically activated when the conditions are met. However, if you would like to cancel the auto defogging system, press the front defroster button 4 times within 2 seconds while pressing the AUTO button. The indicator will blink 3 times to notify you that the system is cancelled. To use the auto defogging system again, follow the procedures mentioned above. If the A/C off or recirculated air position is manually selected while the auto defogging system is on, the auto defogging indicator will blink 3 times to give notice that manual operation is canceled. 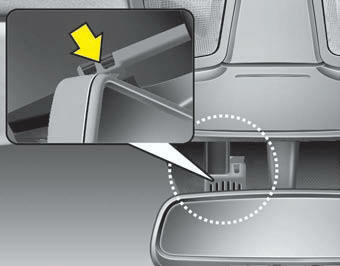 Do not remove the sensor cover located on the upper end of the driver side windshield glass. Damage to the system parts could occur and may not be covered by your vehicle warranty.